7 tips for helping to prevent falls. 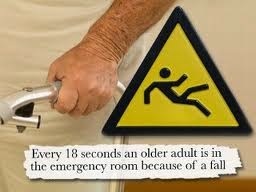 Every year over 13 million seniors fall, that is one every few seconds. Falls can mean broken bones, hospital stays, dehydration (if they are unable to get up on their own and not found for several hours), and so many other medical complications. Falls can be especially harmful if they happen at night when the senior is alone. Why do seniors tend to fall so often? Falling doesn’t just happen, and it is not a direct consequence of getting old. However, certain risk factors for increased falling tend to be higher in the senior community. Muscle weakness: Many seniors simply do not do enough to maintain muscles strength, flexibility, and endurance. Regular exercise can help reduce the risk of falls. Poor Balance: Many seniors have poor balance or difficulty walking simply due to medical conditions such as arthritis. There may be neurological causes, lack of exercise, or other disease and illness that cause this. Blood pressure dropping: Blood pressure dropping when an individual gets up from lying or sitting can lead to a fall. This is caused by hypotension which is often the result of dehydration. Many seniors get dehydrated because as people age, the body's ability to conserve water is reduced, the thirst sense becomes less acute, and individuals are less able to respond to changes in temperature. Other factors can also cause this such as diabetes, Parkinson’s and other neurological conditions. There are many reasons seniors fall more, from slower reflexes to sensory problems, to poor eyesight and more. The risk of falls is increased at night when lights are low and individuals are more likely to be disoriented. Stay in bed. Most falls occur at night when individuals get out of bed for things like using the bathroom, getting drinks, etc. If you can stay in bed this helps eliminate many falls. This can be achieved with planning, the help of incontinence products, and a bed side caddy that can hold things a senior may need at night. Keep objects off the floor. Even things like throw rugs can be a hazard, especially at night. Practicing tidiness can really help to reduce the risk of falls. Keep cords, shoes, and other tripping hazards off the floor. Keep things in easy to reach places. Do not put things too high, too low, or too far back in cabinets, especially in the kitchen. If it is something used regularly, put it where you won’t have to climb or bend too much to get it. Light walkways at night. While it is best to stay in bed, often this is unrealistic, so improve safety and reduce the risk of falls by having night lights to help make it easier to see obstacles in the path. Less balance and slower reflexes means it may be necessary to install grab bars and non-slip rubber mats in bathrooms. Due to the fact that there is water, the bathroom is a high risk area. Prevention through installation of non-slip features can greatly reduce risk. Remember when installing grab bars to do so properly so they can act as support and security rather than a further risk factor. Drink plenty of water. Reduce the risk of dehydration related falls by monitoring water intake and ensuring you drink enough each day. Pay attention to your health. Staying on top of health, exercising regularly, eating and hydrating properly, and even socializing regularly can help reduce the risk of falling, improve balance, coordination and mental acuity, and help reduce fall risk factors significantly.